Great for a sweet treat or the kid's lunch box. Only 87 Calories each! 87 calories each. Makes 43 small muffins. Baking spray – 85 calorie allowance for oiling – omit if you use paper patty pans. Preheat oven to 160 degrees on fan forced setting. Sparingly spray non-stick muffin baking tins or lay out paper pans. 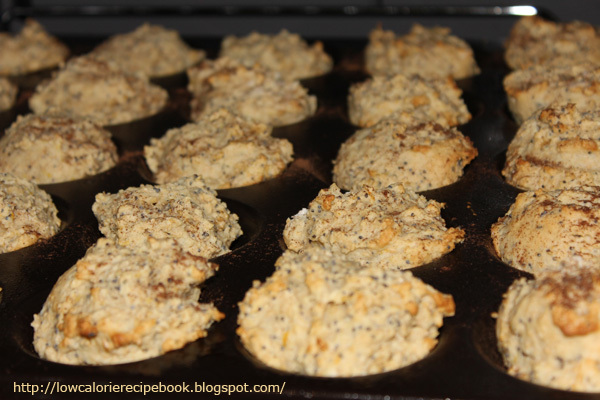 In a large mixing bowl, sift together both flours, baking powder, and add poppy seeds. In another mixing bowl, whisk together brown sugar, no-eggs, vanilla, milk, oil, lemon zest, and lemon juice. Using a rubber spatula, fold the wet ingredients into the dry, just enough to combine. The batter will be very fluffy. Divide the batter among the muffin cups with a heaped dessert spoon and dust with cinnamon. Bake for 15-20 minutes, until lightly browned and a toothpick inserted into the centre of a muffin comes out dry. Cool on a wire rack. Reduce calories by replacing flour with stoneground flour. Stoneground = 280 Calories per 140g (cup) compared to wholemeal at 490 calories. Replace lemon zest and juice with orange for a change. Freeze small batches to avoid picking at these yummy treats. They are ideal for kid’s lunch boxes.